The flatOUT™ LED is the perfect USB Lightning™cable to charge and sync Lightning™ devices. Know when your iPhone, iPod or iPad is fully charged with the flatOUT™ LED. The LED charge indicator pulses RED when charging then turns solid BLUE when it becomes fully charged. 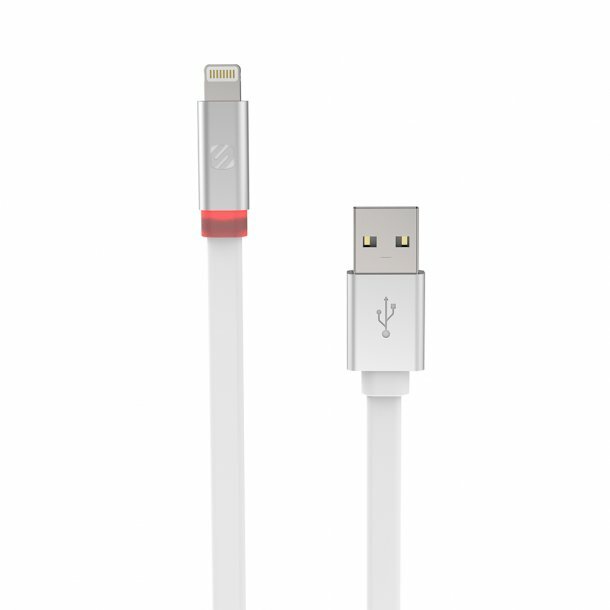 This Lightning™ cable gives you the freedom to use your device while you charge or sync. The flatOUT™ LED allows you to charge your device, as well as allow you to data transfer between your device and computer. With a built-in LED charge indicator, knowing your Lightning™device has finished charging is as simple as a glimps. The LED Charge indicator glows red when charging and turns blue when your device has become fully charged. Blue glow? You’re good to go. The flat tangle-free design of the cable helps avoid the dreadful untangling process after storing your cable.